After two exhausting days on the Corsican wine trail I passed on our first two visits of the third day to try to catch up with some work while I had good access to wifi. It was a tough decision because the first one was a tasting with Sebastien Poly, a young biodynamic vigneron, followed by another meeting with Abbatucci at the new vineyard. Last year, Sebastien was a riot to visit. His personality and wines matched perfectly: playful, smart and energetic. His wines are some of my favorites on the island. I was sorry to miss them both, but the first meeting with Sebastien started at seven o’clock and it was just too early. Manu picked me up at 9:30 and we drove about forty-five minutes south toward Sartène and into one of Corsica’s most picturesque valleys, la vallée de l’Ortolo. 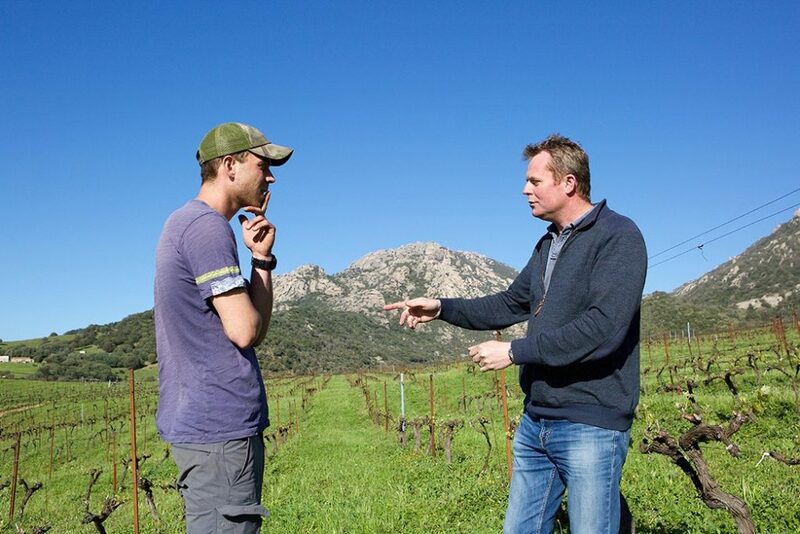 Our first visit was at a beautiful organically farmed vineyard (which I won’t name for now) where the vigneron (who I’ll refer to as François) wasn’t sure how to get the wines where he wanted them to be. I had been along for the ride last year on Manu’s first visit with François and at that time there were a lot of barrels that weren’t so nice to taste. Before our visit Manu said that he will need about three years before the wines start to take a more clear departure from where they were. I didn’t have much expectation for them and Manu wasn’t sure of how they would taste. The question was whether François took his suggestions and ran with them, or fumbled and fell back into the same routine as last year, which is often the case. I consulted for a winery for a number of years, and if they did half of what I asked each year, I considered it a success. Consultants merely serve as council to producers; they are not the ones who make the wine, or final decisions. They can only express their opinion about the vineyard and cellar and explain the adjustments that will bring about improvements. The advice is not always taken, which can make the progress slow and painful. 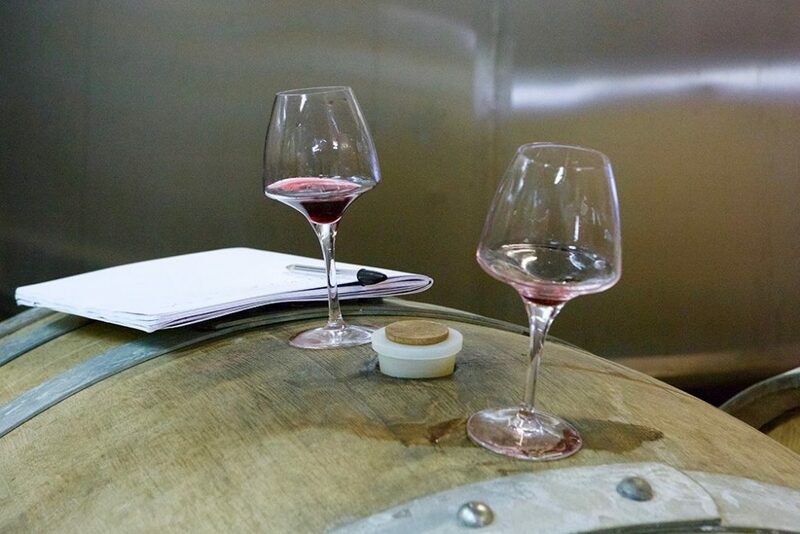 Our first task with François was to taste the 2016 blending material, a vintage that was harvested before Manu was onboard and they tasted a lot better than my memory of last year’s wines. The health of the fruit that year was good and all François had to do was protect the wine and not heavily mark them with bad taste (too much new wood) during the aging. 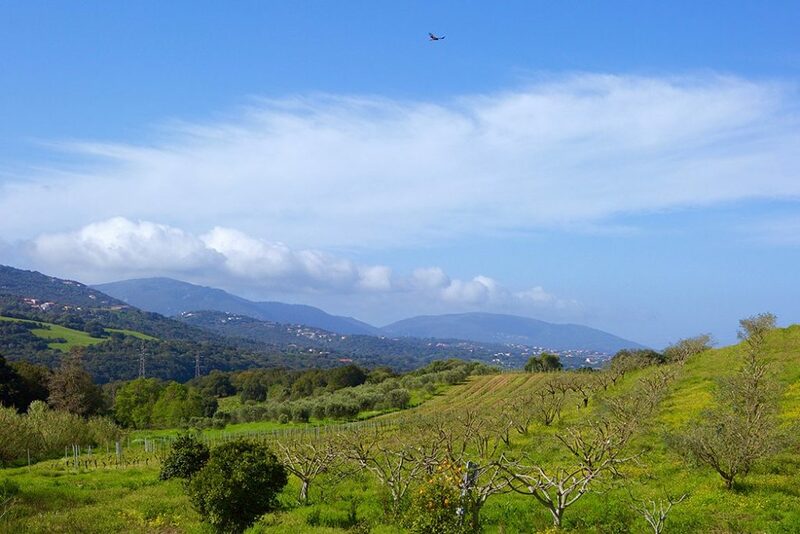 François’ estate is one of the most beautiful polycultural properties we would visit in Corsica, with numerous fruit orchards, olive groves, vineyard parcels and gardens. 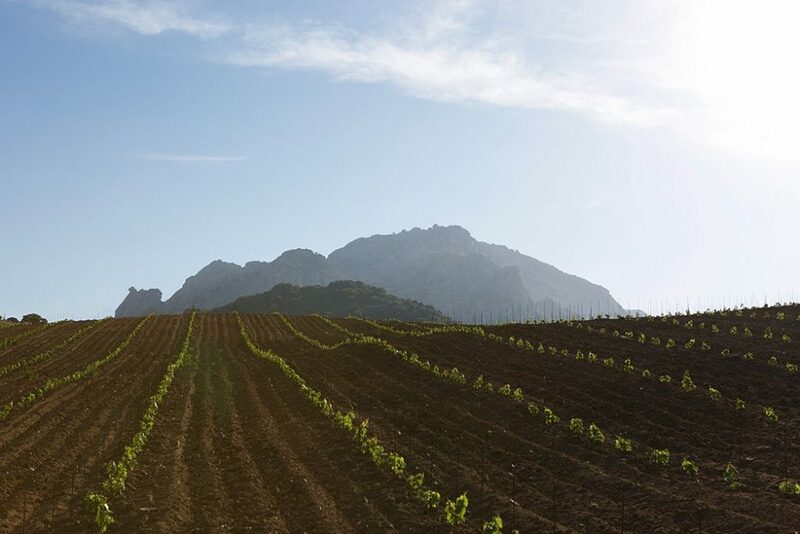 There aren’t many monocultural zones anywhere on Corsica, which makes it somewhat unique to much of France’s most well-known vineyard areas that have every suitable hill covered with vines alone. This estate’s potential is great; the quality of their fruit combined with a few fundamental changes to their program should bring good results, right? The 2017s were unrecognizable from the previous year. The whites were definitely better but not a smashing success, which I thought was due to a combination of a warmer vintage that got ahead of them in ripeness and too much newer wood. The reds, however, were shockingly pure and delicious. His entry-level 2017 red was perfect gluglu (a French term used for a cheap, gulpable wine you can drink by the pitcher) and by far better than any of his others from 2016 and 2015. The 2017 Sciacarello out of tank were wonderful and I asked to retaste them to confirm that I wasn’t tripping out. I was so pleasantly shocked by François’ progress that I’m excited to go back to see what happens next year. I used to work in a winery making wine with Adam Tolmach, from The Ojai Vineyard, in California. In 2002, I went wine tasting in the Santa Ynez Valley to a number of other wineries. I came back enthusiastic about what I tasted out of barrel, even from some estates who I thought didn’t always make such memorable wines. Adam smiled and told me one of the truest statements about tasting unfinished wine: “There is a lot of great wine in barrel, but getting them into the bottle with the same quality is a difficult skill that few have.” I’ve made plenty of mistakes as an importer, but if I’d imported all the wines that tasted great out of barrel before I tasted them in bottle, I’d probably be out of business by now. After our visit, François invited to lunch in Olmeto, a village perched high up on a hillside about fifteen minutes north of Propriano. The name was Restaurante la Source—how fitting! We parked next to an ancient (and long since retired) stone public bath house, crossed the road and entered this rustic joint perched on a cliff with a perfect view of one of Corsica’s most stunning inland areas. At the entrance is a huge wood-fired oven where they were piecing together some pizzas. I still hadn’t recovered from the dense food of Northern France the previous month and again was desperate for some vegetables. But upon seeing the wooden pizza oven, my dream of a light lunch disappeared instantly. We sat outside at about a thousand feet above sea level with a perfect view of the valley below and the range across it. The wind was brisk and chilly, but we stuck it out to marvel at the dreamscape of steep mountains and the fields below. If there were ever a place I should’ve had my camera with me this was it, but I left it in the car and decided to just enjoy it for myself. Still longing for some vegetables, I ordered a vegetable pizza with some local saucisson. What I didn’t know was that I was getting a pile of regional charcuterie thrown on top with a dense portion of local cheeses with a few slices of onion and zucchini. It ended up being one of the best pizzas I’ve had in Europe, and I’ve been on the hunt for them for years. The crust was a perfect balance of crunch and stretch, and the wood fire gave an alluring aromatic accent. It was spectacular. Manu ordered a “small” steak and it arrived on a big cutting board with a salad and fries. The fries were fantastic and looked like they were cooked in animal fat (the only way to do it right) and topped with the perfect amount of flaky salt, which for me means a lot. The steak was Argentinian-like in immensity and though Manu looked at me with disbelief at the size, he managed to get all the way through it. Neither of us had any expectations going in, but now we can’t wait to go back. Our first stop after lunch was with one of the most promising producers in Corsica whose owner is concerned about the prospect of discontinuing the use of chemical herbicides. Manu and the winemaker are pushing to make this final change and it was supposed to happen this year. This last step could result in the filling out of their range of wines that are already quite good. The herbs and grasses on the drive up to the property showed some promise of change. Last year they were a rainbow of orange and yellow, the colors of death by herbicide—a common site in most of Beaujolais and Champagne—but this time, I was hopeful. Once in the door, we were greeted in a kindly fashion by the winemaker, who I’ll refer to as François II (to protect the identity of the domaine during this time of transition), one of my favorite guys in Corsica. Manu went straight to the point and asked him if they bought the machine to plow this year so they didn’t feel obliged to use herbicide. François II’s shoulders rolled forward and disappointment clouded his expression; the owner hadn’t made the purchase, so it was going to be another year of herbicide. What we had seen were grasses still alive because they hadn’t been sprayed yet due to the season’s late winter storm followed by a month of rain. I asked about other chemical treatments and was happy to hear that they had abandoned pesticides three years ago and systemic treatments (the ones that aren’t visible) two years ago, so there was only one more major step to go. Francois II explained that he had done a test of foregoing pesticides in the vineyards years ago and was met with great success, which helped spur the change. Inside forests, untamed land and natural farms (which are all abundant on Corsica) the insect population teems with a wide variety of tiny predators and prey. Pesticide is not preferential; it kills everything, which throws off an ecosystem that’s equipped to manage itself. When he held off on spraying pesticide and used pheromones instead (to confuse the pests during mating season), the diversity of the pests within the brush surrounding François II’s vines proved to be enough to maintain the vineyards without any sprays. Systemic chemical treatments, in particular, concern me. Many vineyards and crops are plowed, manicured and look great, but what’s not visible are the chemicals that are applied to the soil which go through the root system and into the plant’s tissues, including the parts we eat. It’s a big topic and those who use them don’t want to talk about them. This is different stuff than a topical application of herbicide or pesticide because you can’t peel or wash them off. The only way to know if systemic treatments are being used without testing for them is to ask the farmer, which I always do with my growers who are not organically certified. It’s a question that often catches them off-guard, and I’ll know by their non-verbal reaction before they even say a word whether they use them or have in the past. Systemic treatments are not allowed in certified organic farming in Europe. I’ve tried to find out if they are legal in USDA organic farming, but I couldn’t find a definitive answer one way or the other. We tasted through François II’s range of bottled 2016s as well as the 2017s out of stainless steel tanks and they were all beautiful. Ugh… This kind of moment kills me because I don’t want to like this herbicide vineyard wine. 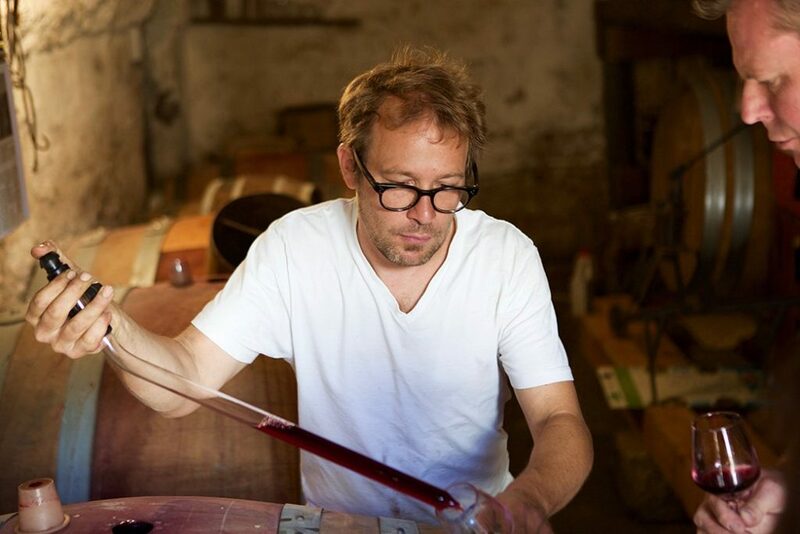 François II is the saving grace at this domaine because he is an excellent vigneron. The good news is that the intention to make the change is there and it seems to be only a matter of time. My fingers are crossed, but we will have to wait another year. Like the use of pesticides and systemic treatments, I consider the unconscious, habitual and regimented use of herbicides malpractice. Indeed, there is a tremendous amount of truly inspiring wines that use these unnatural treatments but my personal preference is to not drink or import them. Our next visit at Domaine Pero Longo was a stark contrast to the previous. 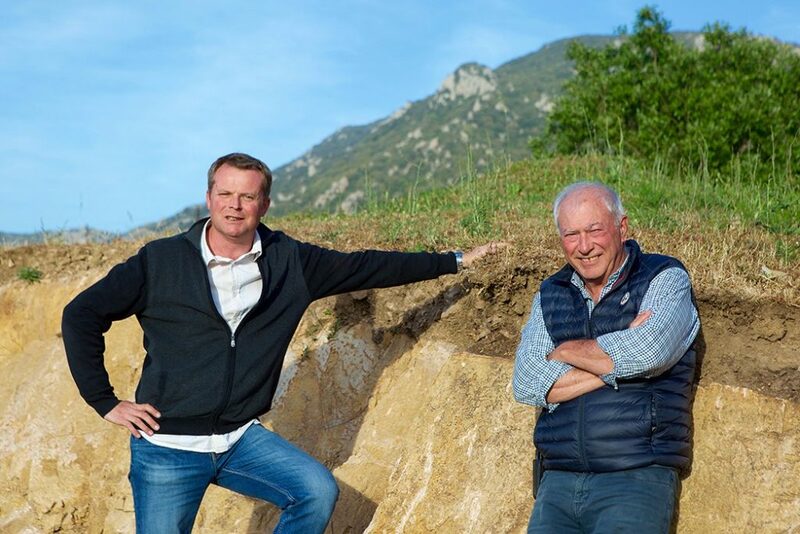 I was excited to see Pierre Richarme, the owner and vigneron and all of his vineyards, which bustle with life and have been under biodynamic culture for many years. From the west, it looks like a giant mythological lion (perhaps Corsica’s Lion of Roccapine) scratched massive dark vertical gashes down Ranfone’s pale granite cliffs, giving it a unique and mysterious appearance. Pierre’s winery rests up on a foothill of Ranfone with a perfect view of its southern end. Surrounded by vineyards and a cow pasture to the south, the winery is made from slabs of local granite, all put together by Pierre’s hand, as were his house and bed and breakfast. My memory of the visit with Pierre the previous year was still vivid, so as we arrived it seemed like only a couple of weeks had passed since I was there last. His smile is warm, like sunshine, and the gap between his two front teeth makes it even more charming. The creases in his weatherworn face reel you into dark eyes that show humility and honesty. His nearly 70-year-old body is worn but still strong. His hands are dense, thick and dry, like an old cowboy’s leather gloves. His handshake is firm and welcoming, and reminded me of my dad’s old hunting buddies. As much an artist as he is an artisan, Pierre’s creations are rustic, practical and original. 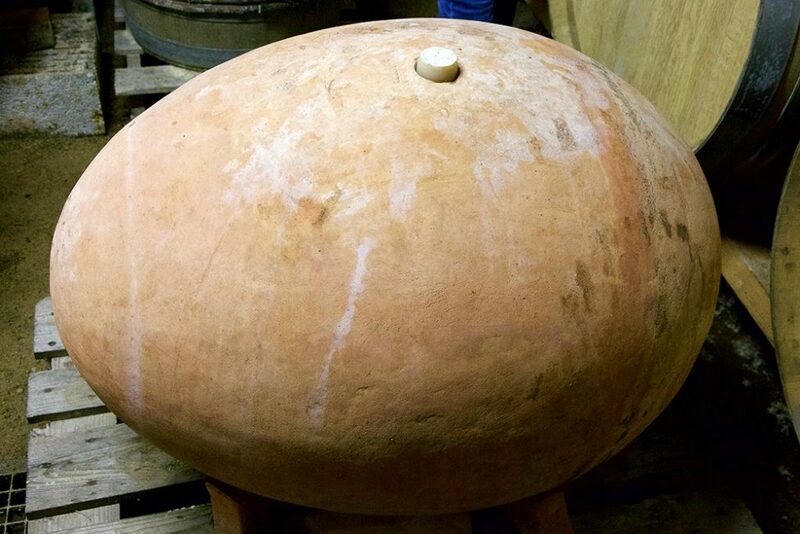 In his winery he built sideways concrete eggs, which I’d never seen before, and when I asked why he built them sideways instead of upright, he said that if you set an egg down it will always fall on its side. Pierre finds his own harmony with nature and nothing in his process is taken for granted. He’s the kind of person who will only be satisfied by learning through his own adventures as opposed to taking someone else’s word for it—an approach I can relate to, for better or worse. He’s a self-made man and authentic, and this is what draws me to him; I’m sure they’re the same reasons that Manu is so fond of him as well. Yet Manu admitted that Pierre’s search for truth on his own terms often undercuts Manu’s suggestions, though Pierre will come to those same ideas on his own after a number of years. When we arrived, Pierre wasn’t there. We were greeted by his son, Quentin, a tall, wiry, steel-cable of a young twenty-something. Without an ounce of slack on his frame it’s obvious that he’s a hard worker, like his dad. He’s come to work with his father now after going to wine school and Manu believes that his influence and assistance will help to further the quality of their wines. Pierre was more than an hour away and we didn’t have much time, so we started the tasting without him. Just like last year, not everything at Pero Longo was a hit, but when they were on, they could easily be put at the top of the class of reds from the island. Manu and I thought the best wine we tasted was the 2016 red in the sideways eggs. Compared to numerous other lots of the same wine being raised in square concrete tanks a few feet away, it was as straight as an arrow, more high-toned, fresh and refined. 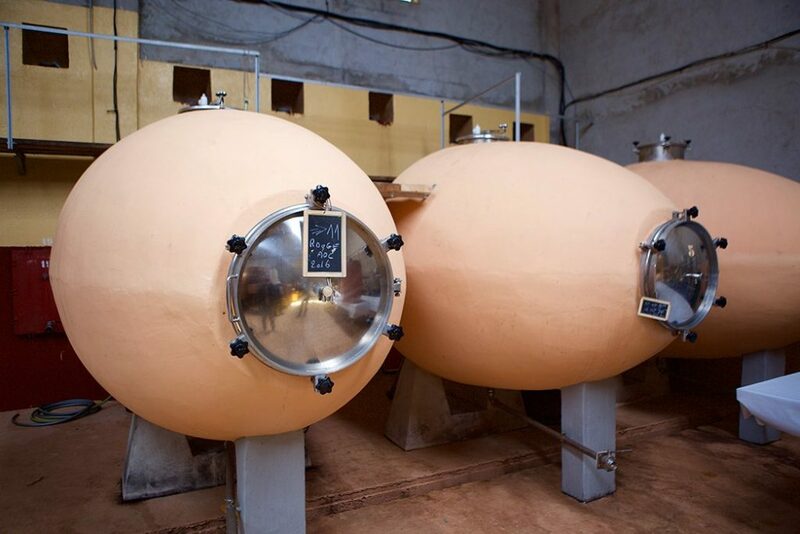 Manu and Pierre have the same theory about the egg and its potential contribution to a wine. If placed properly in the winery (away from water currents, electricity and metal) it can communicate a wine’s story with more purity and focus than in stainless steel, or concrete tanks—just as it did on this day and in the cellar of Jean-Charles Abbatucci the day before. After almost a month on the road with a lot of dreary weather, this day was by far the top for photography and I took advantage of it before the sunset. I snapped some pictures of Manu and Quentin with the constant soft blue-gray haze that sits in front of every mountain view on the island. Then we finally jumped in the truck and headed to Porto Vecchio for an interesting night with twenty or so of France’s top vignerons.